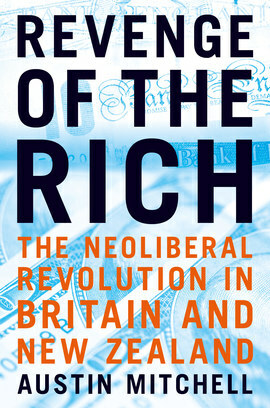 Austin Mitchell's book is the first comprehensive study of the rise, fall and consequences of neoliberalism in Britain and New Zealand, the two countries which adopted the new economics most enthusiastically, became its poster boys in the eyes of right-wing economists and media AND suffered the most severe consequences. Growing up in the affluent years of a post-war settlement which brought full employment, economic growth and a welfare state to both countries, Mitchell entered Parliament in 1977 as Labour MP for Grimsby, just as the Settlement was failing. It fell apart because of balance of payments problems and the industrial struggles of what was becoming a zero-sum competition between social groups. This began the long march down dead-end street, first in Britain under Margaret Thatcher, then in New Zealand under Roger Douglas and the 1984 Labour government. Monetarism, the triumph of markets, the pruning of the state and particularly its welfare provisions and the belief in tax cuts to incentivise the wealthy all combined to turn Mitchell's long service in Parliament into a fighting retreat. The social balance of both countries was shifted to wealth and finance, away from industry and the people. The rich took their revenge. Mitchell chronicles the consequences in low growth, zero-sum politics, growing poverty and increasing inequality. He demonstrates how neoliberalism has failed to deliver on its promises and how wealth has trickled upwards not down. He concludes with the turning of the tide by a peasant's revolt leading to governmental and policy changes in both Britain and New Zealand. Ultimately he finds useful lessons in the failure of neoliberalism and points to a society and an economic policy which will be fairer for all.